Respighi is celebrated, perhaps too celebrated, as the composer of the three tone poems celebrating the history and splendours of Rome � Fountains of Rome (1914-16), Pines of Rome (1923-4) and Roman Festivals (1928). These works have too long overshadowed his considerable achievement in many musical forms including music for the ballet and orchestral songs. Respighi was much influenced by the writings of the English poet, Percy Bysshe Shelley, and set in addition to the verses on this album, The Sunset (as Il Tramonto) in 1914, the same year as La Sensitiva, the most extensive of the three settings. La Sensitiva�s first performance was delayed by some seven years after its completion; it was premiered, with the composer�s wife, Elsa, as soloist, with the Czech Philharmonic Orchestra under Vaclav Talich in Prague in January 1922. La Sensitiva (The Sensitive Plant) is the fate, benign and cruel, through the seasons, of the mimosa. Respighi�s orchestral palette is resplendent with vivid colours; he artfully creates atmospheres that are vaporous, lush and voluptuous, coolly melancholic and coldly decaying; all beautifully and evocatively captured here. Damiana Pinti is a most expressive mezzo colouring her voice according to the emotions suggested by the passing seasons, her vocal line silken � although, it has to be said, often at the expense of text articulation. Aretusa, inspired by the Greek myths, tells how the river god falls in love with a terrified river nymph and relentlessly pursues her over waterfalls and across seas until she reaches Syracuse, Sicily where she becomes transformed into the City�s famous spring. Respighi�s sparkling, evocative music, not surprisingly, resembles his Fountains of Rome. Again Pinti�s expressive singing impresses but at a pinch I prefer the rival Collins recording (13492) that features Dame Janet Baker and includes a lovely version of Respighi�s Il Tramonto. In the context of ballet music, Respighi is best remembered for his adaptation of piano pieces by Rossini for La Boutique fantasque. This production, premiered by Diaghilev�s Russian Ballet, in London in 1919, was so successful that the Company, under the direction of the Russian dancer, Ileana Leonidev, commissioned three further ballets from Respighi: Le astuzie di Columbina, S�vres de la vieille France and La pentola magica. The three ballets were premiered together in Rome in November 1920. Premiere recordings of all three ballet scores were released on Marco Polo 8.223346 with Adriano conducting the Czecho-Slovak Radio Symphony Orchestra (Bratislava) in witty and vibrant performances. 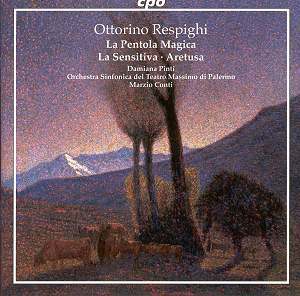 This new recording of La Pentola Magica is of special interest to Respighi enthusiasts because the detail of the ballet�s story has recently been rediscovered so that listeners can appreciate Respighi�s music all the more. The story involves the vain, bored and heartless daughter of the Czar who rejects all suitors for her hand, particularly a handsome but poor young prince. She is intrigued by the sounds of music emanating from a cooking pot outside the palace. In spite of all her pleadings and offerings of riches, the owner of the pot, a penniless peasant, who had been seen dancing to the music, refuses to give it up. He demands her kisses, she reluctantly agrees. The court is shocked. The Czar is outraged and disowns his daughter locking her out of the palace. She cries in despair. The peasant throws off his wig. It is her rejected suitor, the young prince. �You refused me � take the pot; I don�t need it, or you �� The Czar�s daughter is left out in the rain while her cruelly used maidservants look on laughing. Respighi performed, and studied - with Rimsky-Korsakov - in Russia during his early years and so it was natural that this ballet music should be strongly influenced by the Russian masters, Tchaikovsky in particular. The lullaby-like Prelude, for instance, is derived from a piece by Grechaninov, the �Entrance of the Czar� by music by Arensky, and the brilliant �Dance of the Tartar Archers� by Anton Rubinstein. Pinti responds excitingly and sympathetically to Respighi�s melodic music, so colourful, fairy-tale atmospheric, and so Russian. The CPO sound is that much better than that of the Marco Polo reading. A sultry yearning melody, featuring Damiana Pinti, follows the Prelude before the tempi pick up slightly for the colourful tambourine-led �Danza�. The entrance of the Czar is regal, rather �Elgar in Moscow�. �Scena della Tzarewich� is correspondingly tender and entreating, lovely and lyrical before the music turns grotesque, sounding like squabbling hens and not unlike Bernard Herrmann�s frenzied Psycho string music. The presto �Danza degli Arceri Tartari� is proud and one can imagine those arrows swiftly hitting their mark. �Danza Cosacca (Kosaci�k)� is like something one hears from a music box contrasted with a rustic folk dance that burns to a wild crescendo. �Danza della Seduzione�, like �Danza e Horowod� is gently persuasive, its measures having an almost 18th century formality. Brightly-coloured and involving performances of not-so-well-known Respighi works. Recommended to Respighi enthusiasts. Note: Amazon suggests that this disc requires SACD hardware but the review disc was playable on a standard CD player.